Habit: Biennial, short-lived perennial herb. Stem: erect, 4--20 dm, < 1.5 cm diam, purple-red. Flower: corolla glabrous, red (white), tube 15--20 mm, upper sinus >> lateral; anther tube 3.5--4.5 mm, triangular bristle at tips of 2 shorter anthers 0. Chromosomes: n=7. Unabridged Note: Incl by McVaugh in Lobelia cardinalis subsp. graminea (Lam.) McVaugh, with 3 other varieties including Lobelia cardinalis var. multiflora (Paxton) McVaugh (pls with dense, short hairs throughout, leaves lanceolate to ovate, probably not in California). 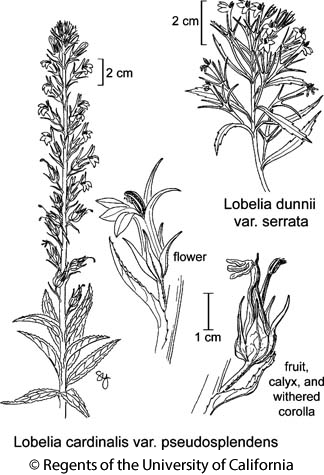 Citation for this treatment: Tina Ayers 2012, Lobelia cardinalis var. pseudosplendens, in Jepson Flora Project (eds.) Jepson eFlora, http://ucjeps.berkeley.edu/eflora/eflora_display.php?tid=60969, accessed on April 19, 2019. No expert verified images found for Lobelia cardinalis var. pseudosplendens. SnGb, SnBr, PR, DMtns (Panamint Range); Markers link to CCH specimen records. Yellow markers indicate records that may provide evidence for eFlora range revision or may have georeferencing or identification issues. Purple markers indicate specimens collected from a garden, greenhouse, or other non-wild location.